Biological Enterprises are well known makers and Suppliers of Cement Autoclave units in India. These Industrial Cement Autoclaves are fabricated in accordance with IS: 4031 (Part III). 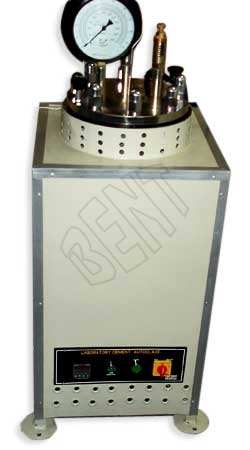 This equipment is apt for conducting accelerated soundness tests on cements as well as the autoclave expansion test, needing a constant steam pressure by the corresponding constant temperature. It consists of a stainless steel cylinder with an insulated cover, mounted on a sturdy supporting frame, enclosed in a heat insulated metal housing. The attached control unit encloses a sensitive pressure regulator and pressure gauge, power switches and pilot lamps for controlling the electrical heating units.